I’m currently the technical architect on a huge Salesforce project in the UK. How huge? 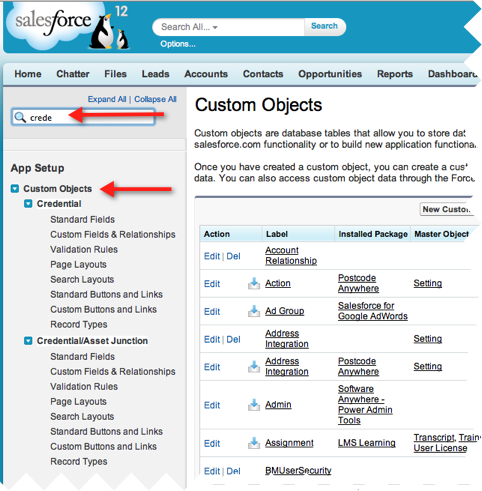 108 custom objects, 338 Apex classes, 22 components, 59 triggers, 152 VisualForce pages and growing. You can imagine how frequently you’d be updating custom objects, checking their layouts, field security etc. You click setup, create, custom objects, scroll up and down the list till you find it, click on the object, scroll up and down to find what you wanted. Exhausting. Thanks to Tim Dupont over at Reside for turning me onto a much better way. He uses a GreaseMonkey script that inserts Custom Objects as a top level node on the App Setup tree. That combined with the new quick find feature, makes getting directly to what you want to edit quick and easy. Script can be found at http://userscripts.org/scripts/show/95361 I wish it also worked for classes and pages and such, but I’m usually doing that in Eclipse anyway.